CNN White House correspondent Jim Acosta referred to Angel Moms as having their children "allegedly killed by undocumented immigrants" on Friday. Acosta reported from the White House on Friday before President Donald Trump's speech and subsequent press conference about his decision to declare a national emergency at the southern border, in order to secure funding for his long-promised wall. Mothers of children killed by illegal immigrants brandished pictures of their children at Trump's announcement, reportedly drawing derision from one reporter in attendance. "We saw people leaving the White House there with photos. Do we know who they are?" anchor Jim Sciutto asked. 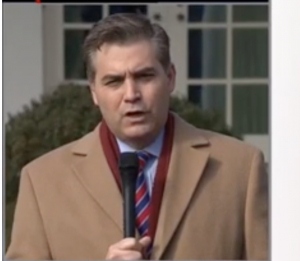 "Jim, we believe those are some of the Angel Moms that the president has talked so much about out on the campaign trail, at rallies and so on," Acosta said. "These are parents of victims who were allegedly killed by undocumented immigrants. The president likes to point to these folks who have been through some terrible experiences as evidence a wall is needed down at the border." "I suspect, Jim, if we're seeing some of the Angel Moms coming in, the president is going to be trying to drum up some emotional energy on this occasion here, to try to sell this wall," he added. "We have seen him do it before." Later, Sciutto referred to the Angel Moms as "mothers who lost children, or alleged to have lost children to undocumented immigrants in this country." At Trump's State of the Union address last week, he pledged never to abolish Immigrations and Customs Enforcement (ICE), as some Democrats have pushed for, and said the "wonderful" angel families he had gotten to know shouldn't have to suffer heartache because of illegal immigration.